Or the ghost of Spuds MacKenzie, anyhow. Bud Light's bull terrier mascot from the 1980s is returning to the Super Bowl on Sunday. Anheuser-Busch unveiled a 90-second ad on Thursday in which dog's ghostly image appears before a loner to teach him about the true spirit of Bud Light. "My soul can't rest when people don't drink Bud Lights with friends," says the floating icon, voiced by the baritone Carl Weathers, of "Rocky" fame. It's a long way from Christmas, but the ad borrows heavily from "A Christmas Carol" and "It's a Wonderful Life" as the apparition of Spuds drags the dude along to show him the lackluster life of his beer-swilling friends. 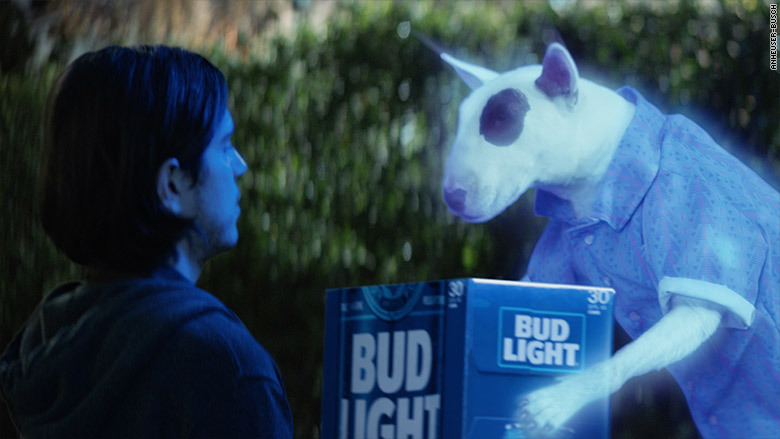 Bud Light icon Spuds MacKenzie returns as a ghost in his upcoming Super Bowl ad. "They needed you, and you weren't there for them," says Spuds when the man's friends fall flat in a barroom trivia contest. The lesson learned, Spuds sends him into his friends' party with a case of Bud Light, imploring him to "Crack open one of those BLs. I don't have thumbs." The original Spuds died in 1993 after a short but illustrious career as the face of Bud Light. He first appeared in a Super Bowl ad in 1987, five years after the introduction of the blue-canned brew. 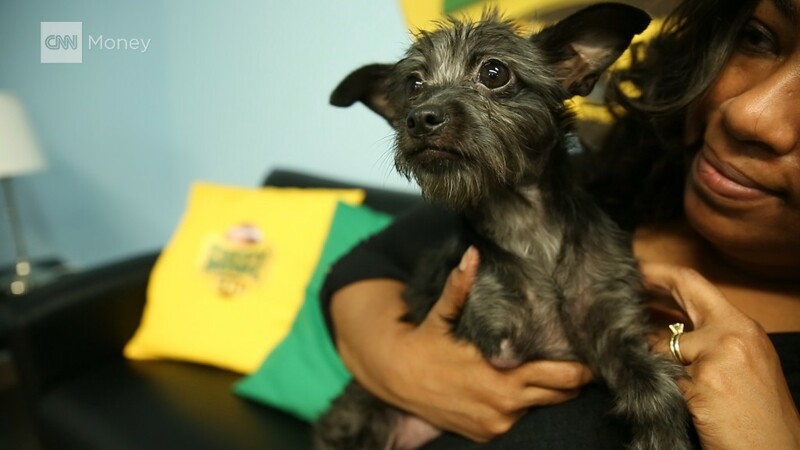 The dog's last commercial was in 1989. 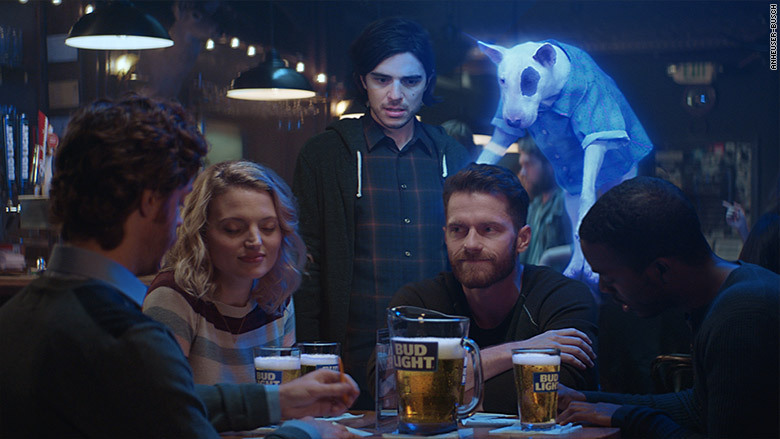 Anheuser-Busch said the ghost of Spuds is played by a dog actor, not a computer-generated image. The ghost of Spuds MacKenzie gives away a case of Bud Light at the end of his Super Bowl ad. Anheuser-Busch (BUD) is generally the most prolific Super Bowl advertiser and has at least three minutes' worth of spots in Sunday's game. Fox is charging an average of $5 million for a 30-second spot. A separate ad for Budweiser explores the theme of immigration. The ad depicts company co-founder Adolphus Busch arriving in the United States in 1857 as a German immigrant and being confronted by angry Americans shouting, "You're not wanted here! Go back home!"